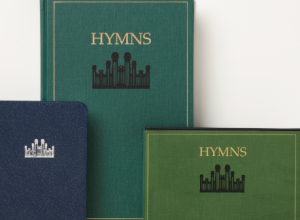 The September issue of the Ensign magazine includes an article celebrating the 30th “birthday” of the LDS hymnbook, Hymns (74-75). Even though the Ensign clearly states “there are no plans at this time for a new edition,” rumors are circulating to the contrary. Why the Mormon community would think a new edition is in the works despite such a clear “official” statement is interesting food for thought, but that’s not the topic of this blog post. I remember the first time I saw “Praise to the Man.” I was flipping through a Mormon hymnal while visiting the home of a friend who had recently joined the LDS Church. The lyrics stopped me cold. “Long shall his blood…plead unto heaven…, Great is his glory…, Earth must atone for the blood of that man…, Mingling with Gods he can plan for his brethren,… Millions shall know ‘Brother Joseph’ again.” I was…shocked. I knew a fair bit about Mormonism at this point, but this. This struck me as unabashed blasphemy, and it shook me deeply. Perhaps it is Dr. Riess’ protestant background that helps her recognize worship of Joseph Smith inherent in “Praise to the Man.” Many Mormons don’t seem to get that. They seem entirely comfortable with the hymnal including “Praise to the Man” just two pages ahead of the hymn, “Praise to the Lord” (as published in my 1948 edition, hymn numbers 147 and 150 respectively). Meet with their Savior Lord—Joseph, the blest! This hymn is not in my 1948 hymnal; I’m guessing it’s not in the current LDS hymnbook either. The Seer, the Seer, Joseph, the Seer! By searching the wide world around. And men he taught the heavenly way. The earthly Seer! the heavenly Seer! And opened The heavenly world to view. Like the sun he spread his golden light. The stream of crime in its reckless way! He stood at The helm of the ship of life. The Saints, the Saints, his only pride! Their joys were his, their sorrows too. He loved the Saints; he loved Nauvoo. He pleads their cause in the courts above. The Seer, the Seer! Joseph, the Seer! O how I love his memory dear! A father he was and is to me. No matter, He is beyond their power. He’s free! he’s free! The Prophet’s free! He rests unharmed in endless life. Far from the furious rage of mobs. He died, he died for those he loved. He reigns; he reigns in the realms above. To welcome the Saints to Zion’s shore. We’ll meet him, Our martyred Seer, in heaven. Joseph Smith’s glory, honor and majesty…forever? No. That is over-the-top praise (worship?) of a man. This entry was posted in Joseph Smith, LDS Church and tagged "Praise to the Man", Church of Jesus Christ of Latter-day Saints, Hymns, Joseph Smith, LDS Church, Mormon Church, Mormonism. Bookmark the permalink. Joseph Smith does’nt deserve the adulation that Mormons give him . The glorious truth that hopefully the Mormon people will discover is that they simply do need him nor his successors in order to have a right relationship with God and receive eternal life . That’s the bottom line . I would ask the LDS to give consideration to who Jesus is and what He did for us on the Cross. I agree. If Mormons really knew who Jesus is they would know where to relegate any apostle or prophet in their daily speech and thinking process , and that is summed up by John the Baptist in Jn 3:30 : All prophets / apostles must fade into a very minimal place in one’s life . To a sinner redeemer by the grace of God through faith in a loving Savior , no man is the focus in their thought life but Jesus , and rightly so . Worshiping Jesus is reality , adoring Him is their spiritual and emotional sustenance . For those redeemed by the blood of the Lamb , they also gain a personal relationship with the risen Savior , daily telling Him of their thanks and giving Him adoration . The Mormon people give Joseph Smith , Brigham Young etc way to much space in their minds and hearts . That is a red flag , and those thinking about joining the Mormon church should consider that. Let’s not forget LDS leader Bruce McConkie who warned BYU students about seeking a personal relationship with Jesus Christ. Those who have left the LDS church talk about how little Jesus is emphasized within the sect. Praise Joseph Smith and ignore Jesus. That’s a formula for spiritual disaster. I don’t think it can be said that Mormons ignore Jesus . They would say that His name is in the title of their church and that their leaders do talk about Him a lot . Aside from the fact that the Mormon Jesus is ” another Jesus ” ( 2Cor 11:4 ) , Mormons truly believe they are His true fold . That being said , there is still some things off kilter within Mormonism and one of those has to do with their prophets especially Joseph Smith .It seems he shares the Marquee as it were with Jesus when it comes to their testimony , at least that is what we have heard from ex-LDS telling of their experiences in a Mormon fast and testimony meeting — it’s usually about “the church” , ” the prophet( J.S. ) ” , but Jesus is not mentioned every time by the majority of those testifying . Perhaps our ex LDS friends here could elaborate on this . At any rate , I remember reading where Mike Tea ( former LDS ) showed the hymn ” Praise to the Man ” to people he met and asking them who they thought it was talking about . They said it was talking about Jesus . It’s sad that decent people can be so detoured into a religious system where a man is elevated so high in their minds . Joseph Smith does’nt deserve the kind of homage his followers give him . I thought that this is really good and reflects what happens when Christians aren’t well grounded in the Word but center on subjective experience. This is not a new phenomenon. It goes back to the early Church. It takes maturity and discernment to sort out the real from the counterfeit. Unfortunately, many raised in the LDS religious sect for example, have never experienced anything but a counterfeit so it’s the norm for them. Christians seeking spiritual experiences instead of Jesus can easily be manipulated when driven by their emotions. Christianity is undergoing a paradigm shift of major proportions — a shift from faith to feelings; from fact to fantasy; and from reason to esoteric revelation. Leaders of this Counterfeit Revival, have peppered their preaching and practice with fabrications, fantasies, and frauds, seemingly unaware of the profound consequences. Many of the followers who at first flooded into Counterfeit Revival “power centers” have become disillusioned and have now slipped through the cracks into the kingdom of the cults. I’ve noticed that there seems to be two extremes within religious practice, both of which need to be avoided. On-the-one-hand, we have the hyper-emotional groups, on the other we have those that are dry and dead and devoid of the Spirit of God. This is where mature leadership is important. Interestingly enough, the LDS have a culture of feeling the Spirit which comes out of the 19th century evangelical Christian revivals. But to those who have gone to LDS worship services, they report that they are dead, dry, boring and take on the ambiance of a funeral. I guess you can’t worship and praise Jesus if you don’t know Him personally and see Him as a valiant older brother rather than the eternal God who gave Himself that we might partake in the Blessings the Father has for us. I can’t think of any song we’ve ever sung in church that has talked about any praise to any of the apostles or any other figure in church history. The very name of the song itself should be a warning to any true Christian. Coming from a Catholic background, in the era I group up in following WWII, we were very much into the saints and of course the Virgin Mary. I can remember one song that we sang in mass, which I attended every week day during school and Sunday, titled “On This Day Oh Beautiful Mother”. In the Catholic program Mary and the saints were “intercessors”. We’d pray to the saints and Mary and then they’d go to Jesus with our request. They had their place in the system. The whole program was pointed to Jesus. Having not been a practicing Catholic for nearly 50 years, I don’t know if any of this is emphasized any more. The Bible tells us that there is one intercessor between us and the Father and that’s Jesus. Thank you Sharon for a fine post. The title of this hymn, “Praise to the Man,” is sadly most fitting given the hymn’s content. Praise man? So wrong. I listened to the talk Elder Ballard gave in the past week or so in some kind of conference in the Provo/Orem area. The most telling thing of all was that after he finished and bore his testimony all about Jesus (or at least the LDS Jesus), the choir hymn was, yes you guessed it, “Praise to the Man”. Tells you everything you need to know. One question I find of interest to address to former Mormons is, “What was your initial “ah-ha” moment that told you that something wasn’t quite right with Mormonism. Interestingly enough, I was watching one video of a woman who said that she was never all that enamored with Joseph Smith while a member. I had thought that all LDS were all in for Joseph Smith. He’s suppose to be the “prophet” who had all these spirit visitations, visions and restoration revelations. I would guess she was humming the “Battle Hymn of the Republic” or something while everyone else was praising Joseph Smith. But think about it. There is at least one sect of Mormonism that view Joseph Smith as a fallen prophet. The claim is that he received the BoM and then went into apostasy. something that is interesting to note because something very similar happened with Mormonism by Joseph Smith a few years after he stated his church in 1830 . In short , according to Mormon leaders , soon after the death of Jesus’ apostles certain men arose who corrupted the gospel of salvation which the apostles had taught . Many important truths were altered , even re definded . The truth of the gospel had become mixed with the new made teachings of men and the resulting amalgamation became effectively ” another gospel ” , just what Paul had warned to watch out for (Gal 1:8 ) . Thus salvation became unavailable for 1700 years until Joseph Smith appeared on the scene and supposedly restored it . This scenario is similar to what happened in Mormonism , and it was commenced by Joseph Smith . The evidence points to Mormon leadership as men who succumbed to personal apostasy and influenced their flock to follow them . Sad but true . The Mormon people deserve to be free from following false prophets arising in the latter days , their leaders are such prophets . All the church activity , good deeds , striving to live godly principles, can not make up for following false prophets . Matt 15:14 . It really shouldn’t come as any surprise that the LDS should sing praises to Joseph Smith. It’s just an extension of LDS doctrine that reduces God to a former man who became a god. In their thinking, Joseph Smith is now a god, just like millions and billions of other men before and just like the men sitting in the pew singing the song. It should be pointed out, that the original “restored gospel” had no such notions. Smith also came up with the idea of “progressive revelation” which gave him license to go in any direction he wanted to go. So he decided that in order to get to the highest level of his Celestial Kingdom, men had to marry many women. It’s a difficult thing for a man who thinks he has priesthood authority, power and the potential to become a god, to give it up.